I had the incredible opportunity to help the GIR team develop the coffee freshness sensing technology that will become part of the Voltaire, launching on Kickstarter today. I’m very proud of how much we accomplished in a very short period of time, but I’m even more impressed with how the technology to enable such rapid development is so accessible. If you’ve ever wanted to make your own IoT device – either commercially, or as a personal project – you might find this interesting. But first, a shameless and resounding endorsement for the Voltaire. I’m a major coffee geek, and my morning espresso is more of a ritual than a routine. Anyone who has ever pulled a life-changing shot of thick coffee knows that you can’t make great espresso without an excellent grinder. So when GIR – the only folks in the world who have made me fall in love with a spatula – said that they were going to build a coffee grinder, I got very excited. But, this grinder is different from any you’ve used before. It’s smarter. If you want to learn more about the product, head on over to their Kickstarter page. If you want to learn about how we developed the sensing technology, read on. Here’s how it happened. 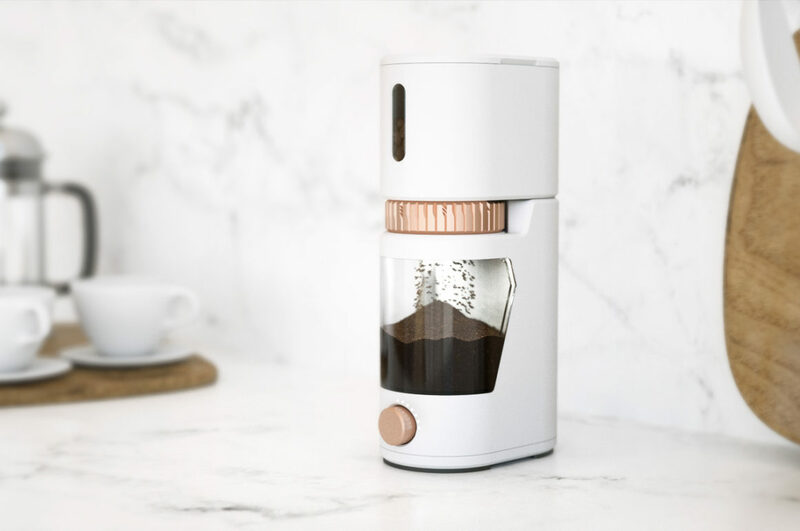 At this year’s International Home and Housewares Show, Samantha Rose, GIR’s founder CEO, showed me a prototype of a grinder that her company was working on – a Mr. Fusion-esque, sleek, portable coffee grinder with high-quality burrs and some very useful features like a digital timer. “But,” she said, “we had this idea to make it sense the freshness of your coffee beans, too. Except we’ve never done that kind of thing before.” My eyes lit up. I had done some of that kind of thing before for Modernist Cuisine projects, and as it turned out, I was about to have a lot of time on my hands. We decided to give it a shot (pun intended). By the end of week 1, we had determined that the idea was feasible. We pored through existing academic and industry research on coffee staling, and I ordered a bunch of gas sensors: CO2, Methane, Aldehydes, Ethanol, and others, and wired them up to a data logger. When I put the sensors in a container with coffee beans, their readings spiked. And, when we left the setup to log data over time, we could see that the concentration of the headspace gasses in the container diminished over time, just as we’d expect from beans losing freshness. This was great news, but far too little data to have certainty that we could determine freshness. Over the next three weeks, we devised and ran a set of experiments to rule out as many confounding variables as we could. We measured and manipulated temperature, humidity, bean quantity, roast type, roast age, and grinding action, and we simulated a handful of storage scenarios before we finally convinced ourselves that the data we read from the sensors could be used as a reliable measure of freshness. Having inexpensive and accurate data loggers let us parallelize much of this testing – one of our tests ran continuously for 30 days! Had we been limited by our ability to record from multiple sensors at once, the timeline would have grown considerably. Once we were confident that this approach was sound, we wrote and submitted a patent application. Since the GIR team had done their industrial design in a CAD environment, it was trivial to create patent figure drawings from the 3D model, including cutaways. I whipped up a crude-but-useable 3D model of how we envisioned the sensing technology integrating with the grinder and rendered that out for patent figures as well. In the old days, we would have had to pay a technical artist to compose those drawings, costing the project both time and money. Now, all you need is Netfabb (free!) or a similar program to open nearly any 3D model format, inspect your parts, slice cutaways, and export your drawings. That closed out week 5. We were on a roll. Now that we had a handle on working with the sensors, and an idea of how to package up the sensing technology, it was time to make a prototype. We decided on a “sensing base” form factor: a platform on which the grinder would sit that contained the electronics necessary for taking the measurements we’d need. Moving from bench experiments running on data loggers to a standalone prototype would allow us to interact with the sensing technology more naturally, emulating a user’s experience at home. 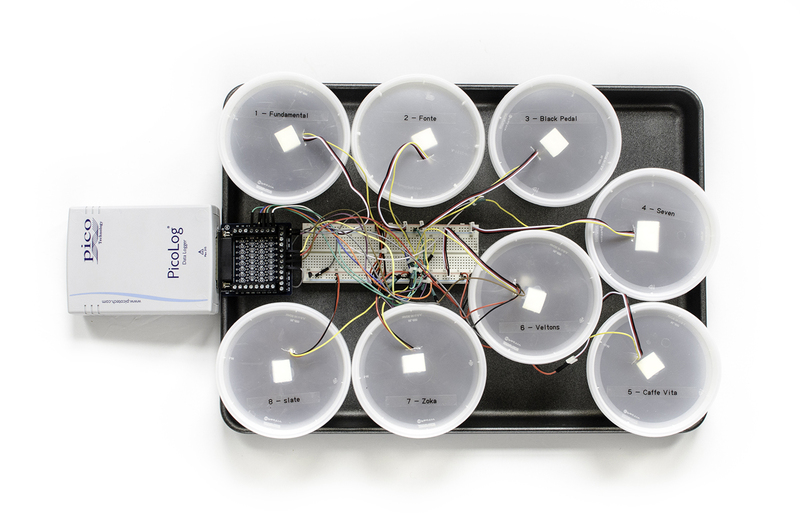 We believed this might reveal key insights about how the freshness sensing experience should be designed – from hardware to service to mobile app – and could inform decisions early on, while changes are cheap and easy to make. It needed to be cheap enough to clone, so prototypes could be deployed for wider testing. I had worked with Arduino in the past, and it was the natural platform choice for a small, internet-connected device that needed to read from sensors and control hardware. But, as we also needed to support a client interface, I dreaded the thought of having to run a web server on Arduino, or worse yet, build a cloud service and native mobile app from scratch. Blynk is also the cloud service and mobile app I had been looking for! You see, on an Arduino running Blynk’s library, the communication between pins on the board and your mobile app is pre-wired. In fact, if you’re doing simple enough things – like turning on or off a pin, reading an analog value, or changing the color of the LED – you don’t even have to write any code. Zero. Not a line. Press a button on your mobile app and watch the Blynk board respond. It was like magic. Of course, our scenario was a little more complex than that. We had to interpret gas sensor values, read from a load cell, output status, and set some parameters that influenced the device’s behavior. In all, I wrote fewer than 700 lines of code (including comments!) to power the entirety of the freshness sensing prototype. Blynk’s code and a few Arduino libraries did the heavy lifting. I also didn’t have to write a single line of UI code to deliver a fully-functional mobile app. The Blynk App (Google Play, Apple App Store) lets you drag-and-drop simple UI controls, like buttons, sliders, gauges, labels and even graphs and a terminal window. Within the mobile app itself, you can connect those UI controls to the Blynk board by assigning them pins: analog or digital pins to correspond to the Blynk hardware, or virtual pins that can be read and written by customizing the software running on your board. The one place where the Blynk offering falls short is in its data logging and retrieval. Blynk does log the data that your board collects. 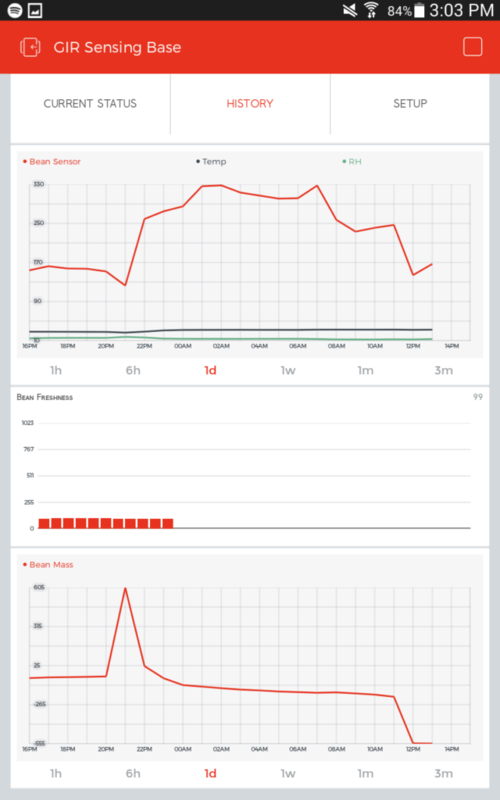 Just add a graph control to the UI and connect it to the pins you want to monitor. However, getting that data back out of Blynk for analysis is still underdeveloped. Yes, there are ways to access it through a REST API, but that’s a pain. So, we decided that in addition to letting Blynk do its logging, we’d also log somewhere more accessible for analysis. The obvious choice was ThingSpeak. It’s a free service designed for IoT devices to stash timestamped data, and they have Arduino libraries readymade. We were restricted to logging every 15 seconds at most, but that’s still plenty of resolution for our needs. When it’s time to analyze, it’s a one-button click to open your log in Excel. Not bad for $0.00. In addition to having user-friendly software, we also wanted the sensing base prototype to have a physical form factor that matched the grinder, and could be evaluated for industrial design and manufacturing. I had previously worked in 3ds Max – a great environment for mesh editing, but problematic for making physical stuff. In the past, I’d run into issues with my 3ds Max models not being watertight or having wall thickness problems when it came time to 3D print. So, I turned to Autodesk Inventor, which is a much more appropriate tool for designing stuff… especially stuff that needs to be assembled. Thanks to some helpful training videos, I was able to get up-to-speed in Inventor in a day or two. 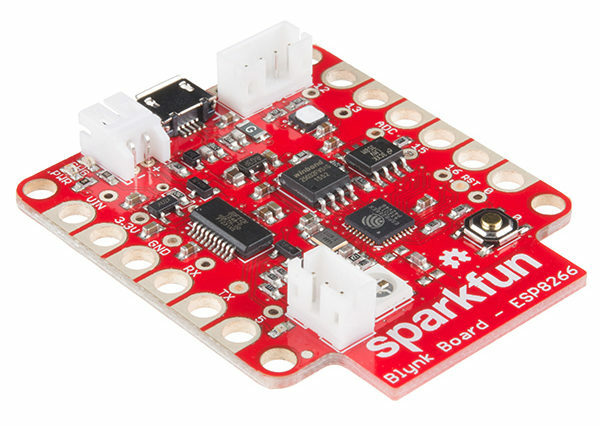 Most of the electromechanical components we used had free 3D models available from SparkFun directly, and I found a load of others on GrabCad. This meant that I could spend less time measuring mount hole spacing with my caliper, and more time projecting the 3D models onto my Inventor drawings so I could see how everything would fit and where screw holes and standoffs should go. I could even drop in standard sized machine screws, making it simple to determine which screws I’d need to buy for assembly. From there, the design process was extremely fast: I was ready to print the enclosure components within a few days of CAD tinkering. I should find 3D printing to be blasé by now since I’ve printed in thermoplastics, rubber, resin, porcelain, and stainless steel, but I’m still blown away every time I hold a 3D object that I dreamt up on my computer. Our big challenge was printing quickly enough to allow for iterations and reprints, if necessary. Although GIR has their own 3D printer, it was in Chicago and I’m in Seattle. That meant adding days of transit to turnarounds, and high shipping costs to rush delivery. Instead, we turned to 3DHubs.com. It’s a service that connects you to people in your area who have 3D printers and will print your parts for a fee. I was lucky enough to find someone a mile away from me who printed my design with a 2-day turnaround for less than $70. That is pretty damn unbeatable. I was thrilled to discover that assembly worked on the first print! [Brushes off shoulder]. All of the internal components fit exactly as they should, screws fit into screw holes, and things that should align did. That’s all thanks to having great software and a community-built library of 3D models at my fingertips. Can you imagine how much this housing would have cost – in specialized software, industrial designers, CNC machining, and finishing – only a few years ago? Without cheap and ubiquitous 3D printing, and the easy-to-use software adoption it has driven, this would have been a months-long, megabucks endeavor. So, after two weeks of prototyping work, and only 8 weeks since we kicked off the freshness sensing project, we had an actual, physical, internet-connected prototype running our own code, measuring actual coffee headspace gasses, controllable with an Android and iOS mobile app, and logging unlimited data to a cloud service for analysis. In the spirit of the maker and hacker communities who drove these technologies forward, GIR has decided to make the sensing base’s firmware open source, and will provide APIs and SDKs to allow enthusiasts to develop their own apps that can work with the sensing base’s technology. Even though it was designed to measure the freshness of coffee beans, I can’t wait to see how others repurpose it! This was a wildly cool project, and it was an honor to be involved. I’m so thrilled to see the Voltaire hit Kickstarter, and I encourage you all to support it if, like me, you care about great coffee.